At First Farm Inn, we ride horses year-round, depending on the weather. Rain, heavy snow, extremely high winds and temperatures over 100 degrees mean rides are rescheduled. For safety’s sake, ground conditions also play a role. But with hills, woods, ponds, pasture and riding arenas, we always have somewhere safe to ride even if the ground is somewhat muddy. Lessons begin with grooming and getting acquainted with your horse. We tack up, mount safely and correctly, then begin in the riding arena, working on basic commands and getting comfortable with your horse. After you have demonstrated control and respect for your horse, we move out and practice riding through the woods and around the farm. Horses can be unpredictable. By coming to the farm, you accept responsibility and all liability for your experience on the ground or riding. First Farm Inn horses are a colorful assortment of breeds and personalities that will be matched as much as possible to your personality and physical attributes. It’s a very individual experience! We never have more than five riders in any lesson. As you gain balance and confidence with your horse, you will be allowed to speed up and stretch your skills. 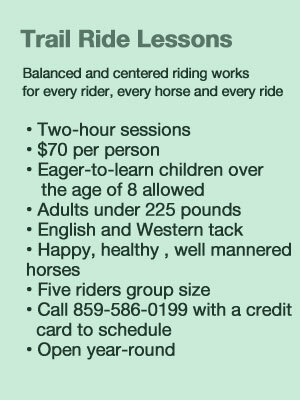 More experienced riders report riding at First Farm Inn is “like owning your own horse” but with coaching to ensure that you are centered and balanced on your horse. Unlike a traditional “trail ride” you will be coached as much as you need, encouraged to build your connection and communicate quietly in a way that your horse can understand. You will learn more than you’d ever imagine about horses during your lesson at First Farm Inn. 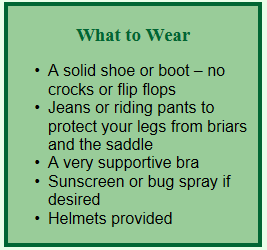 Learn how horses think to ensure your rides and interactions with them are safe and fun.